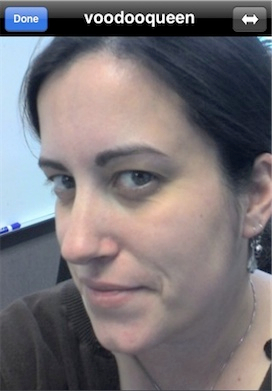 Tap avatar picture to bring up more info on that user. You can reply, reply all, private, copy, retweet, email tweet and send to Instapaper/Read it Later by tapping the tweeter’s name. Follow links! Listen to MP3s! 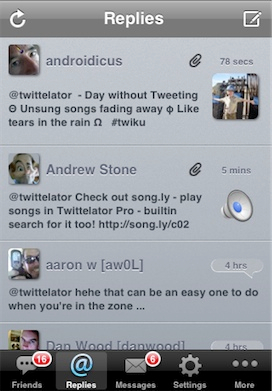 Tabs and More lets you navigate Twittelator - Friends are people you follow - for fun, check out Everyone’s Twitters! Have as many accounts as you want. Follow stocks and trends. 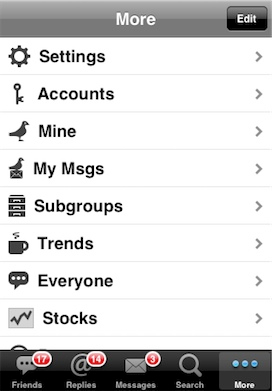 Configure your app the way you want to use it! 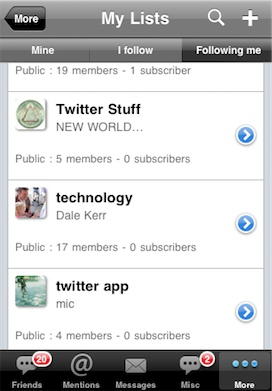 You can put your hot categories on the main Tab Bar for instant access. Tap More’s Edit button, and drag the one you want onto the tab bar. 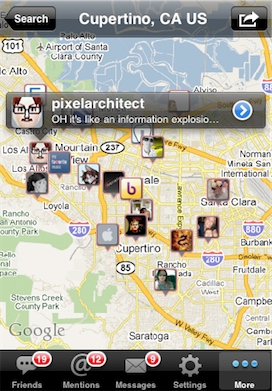 Search Nearby lets you find tweets near your current location - or enter any location on the globe! Tap a tweet to delve into more info! Twitter Lists lets you create lists, subscribe to other's lists, see what lists have you in it - and quickly retrieve the latest updates in any lists. Search for cool lists too! 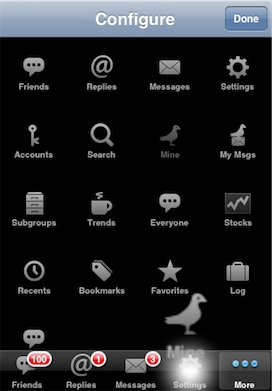 Design Your Own Themes! 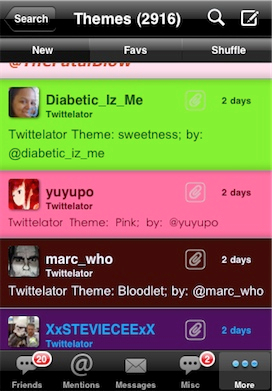 create the look you want - and share your them - almost 3000 public themes available to choose from! Any font, size, or colors. Full Landscape Mode means you can use the entire application in either landscape or portrait mode - great for entering new tweets or just narrowing down your focus on a tweet or two. Tap Name to bring up options. 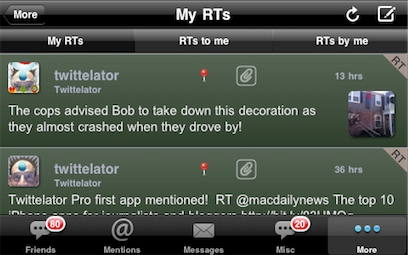 You can reply, private, copy, retweet, email, save tweet and send to Instapaper/ReadItLater by tapping the tweeter’s name. Translate the tweet and if it's yours, delete it. 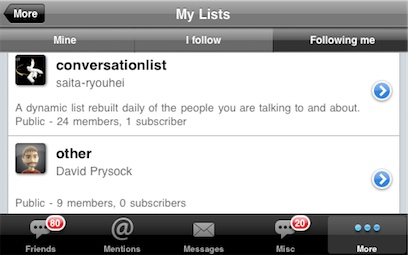 User Detail lets you follow, reply, see their favorites, friends, and add them to your Bookmarks... Follow friends of friends of friends - tap their picture. 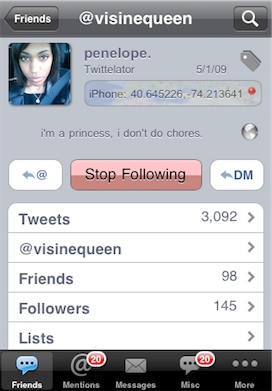 Block/Unblock them - or change device notifications too! Big Avatar loads when you tap the user’s photo. 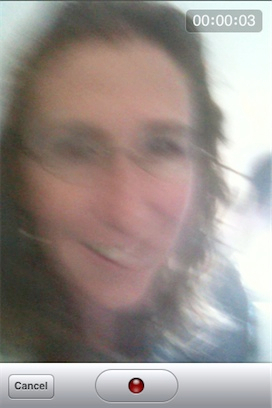 Great for #tweetup’s so you’ll know what other tweeters really look like in advance! 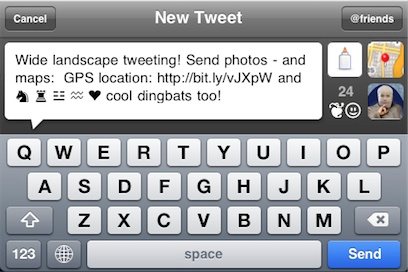 Over 500 dingbats to make your tweets unforgettable! Greek, diacriticals, Hebrew, Zodiac, Trigrams, Emojis and more! 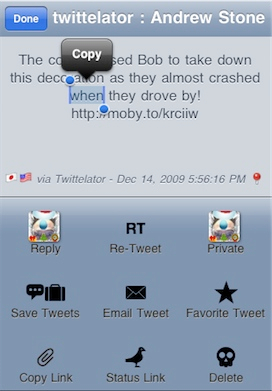 Rotate for wide tweeting - send map of your current location, a photo or snapshot and use Twittelator’s Paste! 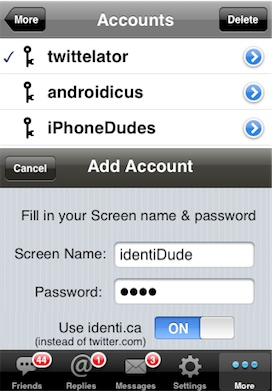 Add any number of Twitter accounts or identi.ca accounts - and quickly switch between them. 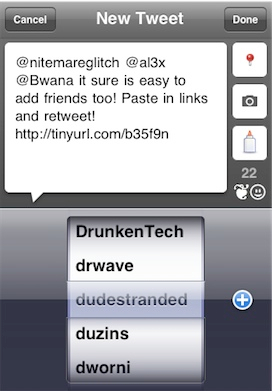 This feature makes Twittelator Pro a must have! 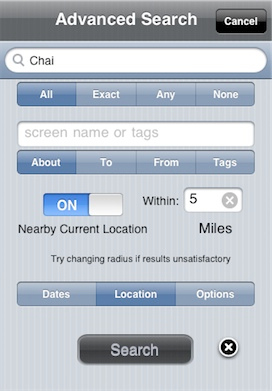 Search has a simple and advanced mode where you can pretty much specify any criteria to narrow search - give it a whirl! Searches are automatically remembered too. 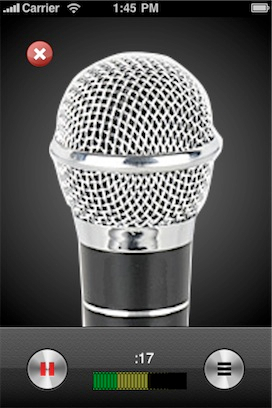 Make Audio Clips wherever you are and whenever you want! Easy as can be. 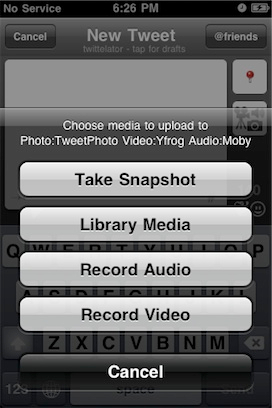 Shoot Video on the fly and upload your movie - of course, you need the 3G S for video.